Hi listeners! Welcome back to a new episode of The 4Geeks Podcast. In this occasion we face Google Cloud and Amazon AWS, its services, security, easy-to-learn, costs, and much more. Both platforms are doing a great job to power up business around the world. So, Google Cloud or Amazon AWS? What’s the best to host and run my product? Hope you can enjoy this conversation and share with us your thoughts. Sergio Monge: Hello everyone! and welcome to another episode here at 4Geeks podcast. Today we are going to talk about a really nice topic it’s a comparison actually. Well, maybe we can go through the difference between Google Cloud and AWS. With me is Allan. Allan is the CEO at 4Geeks. How are you? Allan Porras: Hey Sergio! Hi guys!, thanks for listening this new episode on The 4Geeks Podcast. That’s right, that’s right. 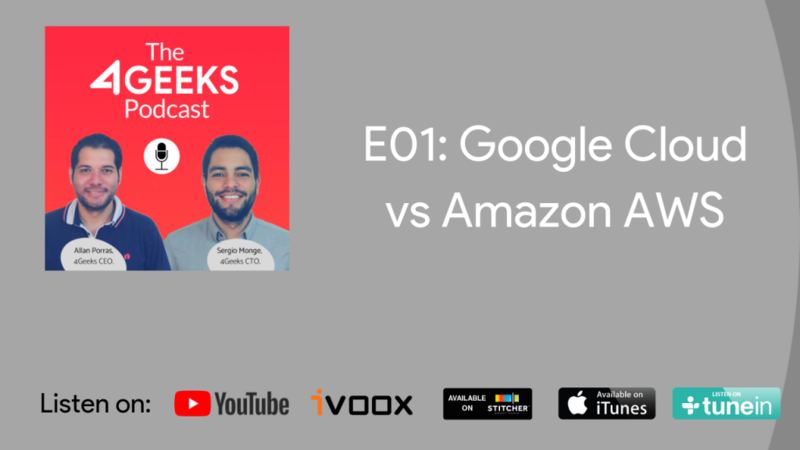 Today we talk about how Google deals with Amazon Web Services and how Amazon Web Services deals with Google Cloud and maybe we can talk, Sergio, about the UX; maybe about the pricing that is very important point for some projects and startups, and products, and security, that is a very important point. So, you are the techie guy. Let’s start. Sergio Monge: Yeah! But first let me know how can I listen this podcast or how can I follow this episodes in my account or how does it work. Allan Porras: Yeah! It’s very easy. You can find this episode in https://4geeks.io/podcast in the website or you can find us on iTunes, iVox, and TuneIn. Just download the app for your iPhone or for your Android, and subscribe it, and that’s it. Sergio Monge: Ok! Perfect. So you have it. Today we’re recording this podcast from Costa Rica, from the 4Geeks offices. We deliver our amazing products here at this office, so let’s go ahead and talk about the UX and the UI experience for Google. Allan Porras: What do you think about that? What do you think about the UX? I think Google personally, I think Google is making a huge huge work in the UX area, you know. What do you think about that? Allan Porras: […] to understand it. Sergio Monge: […] Yeah! It’s easy to know where you are positioning in. But AWS it’s more complex because they have more product. So first time I felt like lost in there in the UI, but when I arrive to Google to Google Cloud Console it was very easy, very intuitive how to click or where to click. So I think this round (if we can say that) it is for Google because the quantity of features they have is just the right and they put it in a good way that you don’t feel lost you you can go directly on what you need you don’t have to go through a lot of clicks or a lot of submenus to see what you need. In Amazon I think this is more complex. So UX for me is for Google, you know and also that day that they clean is he sees why this more is more easier to view. Allan Porras: Maybe AWS it’s old school? Sergio Monge: Maybe maybe, but I think the issue here is there a lot of features they have. Sergio Monge: That’s what I think it is because if you open that it’s like as many with a lot of options. I don’t know, I don’t like it… even even that I’m not a huge fan of Material Design and I’m not a fan of this specific design but I think Google Cloud does it or use it the material design well. Allan Porras: Yeah, another things about about that is to connect specific services, for example, if you want to connect to a specific instance… VPS for example (a linux VPS or a Windows VPS). Connecting from Amazon, from AWS, you need to work a bit more steps. Allan Porras: I think from Google you can connect just for a click on the SSH button. That’s right? Sergio Monge: Yeah! I don’t know how they call but it’s like Google Console. Google Console? Allan Porras: and everything is connected with your Google account, with your Gmail account..
Sergio Monge: you already have it. Allan Porras: Exactly! or with your company email. If you have that you have access. Sergio Monge: Yeah! At the office with someone new, they already have an account when they ingress to 4Geeks. Right? So it’s easy to add some someone to the I am account access. Allan Porras: Have you compared Sergio, how many time … how long time are you taking setting up an instance in AWS vs. Google? Sergio Monge: Well, not with a watch perse, but by feeling I would say Google is faster, with some minutes like 2 minutes I think we can have a cluster running up and running, easily, right? Without not too much customization because I think Amazon provides you that all customization at once. Google is more like simplified on that, so I think Google’s is faster and I don’t have a watch or I can not say like 2 seconds 3 seconds or 50 minutes but I can say by feeling that it’s Google. Allan Porras: I need to say, Sergio, that Amazon has a very good documentation for all the AWS services and for all the Amazon lovers I think so the documentation is very clear and is very specific and it can drive you to the right thing that you want to do, right? but in things to the Google UX, you don’t need to read/write any documentation. Sergio Monge: it’s explanatory. Yeah, the UI goes through the process natural and… but I like the documentation Google as well, they have a lot of use cases, for example, at this moment we are working with Kubernetes a lot at 4Geeks and that’s something that you can find easily that’s specific scenery you are having in the specific moment, so I think the documentation of Google is well. Sergio Monge: The good part. It is touching our wallet. So basically I want to start with the free trial. So what happens with Google they give you $300 I think for usage, so it is pretty good because you can go through a real situation and you can make sure that your budget will be at any specific level so you can know for example if you use the $300 in one day, you can imagine how much you will be spending the next year, for example. So it’s basically a real life situation and we can face on the on the free trial that I really like it. I really like it because we can we can check it specifically how my infrastructure will cost before going life. Allan Porras: I think, Sergio, you wrote a comparable table in a blog and you compared the same stack on Google and on Amazon. What did you get? Sergio Monge: Well, I can go after finish the comparison on the free trial. So, this is Google talking. Well, as I was saying actually GitLab provides more credit if you open the Google account with between them, so opening GitLab and Google you can have $500 to be spent in Google.